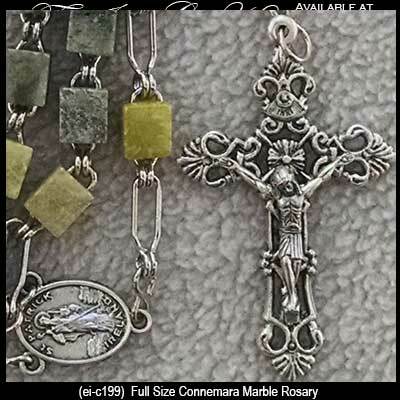 Irish rosary features Connemara marble beads along with a metal Crucifix. 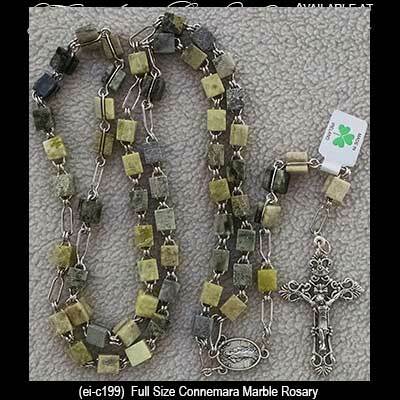 Sorry, this Connemara marble rosary is out of stock. 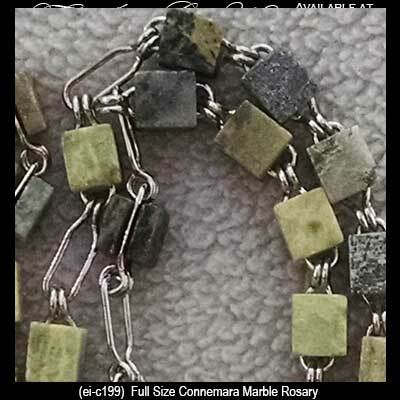 The Connemara marble that is featured in this Irish rosary is the only natural green marble in the world; fittingly, Connemara marble is only found in Ireland. This genuine Connemara marble rosary with square beads is from the Galway mountains of Ireland. The Connemara marble rosary features a silver tone metal crucifix along with a St. Patrick medal. The bead strand of this five decade Irish rosary is a total of 42" long and it is gift boxed with a Connemara marble history card, complements of The Irish Gift House. This Connemara marble Irish rosary is made in Ireland by J.C. Walsh and Sons. This Connemara marble rosary, like all the Irish made jewelry at The Irish Gift House, is nickel free and hypoallergenic. Connemara marble rosary features a Celtic cross along with square beads. Irish rosary features Kilkenny marble beads along with a silver plated Celtic cross and knot-work center piece. Connemara marble rosary is enhanced with a Celtic cross along with a knot-work center piece. Irish rosary is a bracelet that features Connemara marble beads. An Paidrin Beag is Irish for the little rosary and this single decade rosary features Connemara marble beads. Irish rosary with Connemara marble beads is a single decade design known as a penal rosary or as An Paidrin Beag.